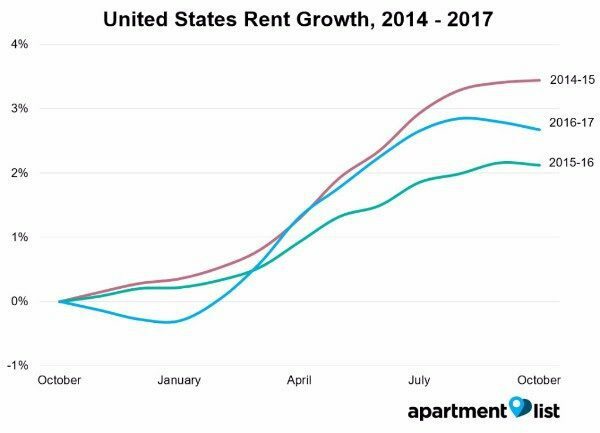 Bucking a state and national trend toward rising rental rates, New York City tallied its second-straight month of declines, according to Apartment List’s October rent report, released Wednesday. But don’t go signing a lease on that amenity-stuffed TriBeCa pied-à-terre just yet — the minuscule drop represents a measly $5 on the average $2,500 two-bedroom apartment. The October decline is down slightly by 0.2 percent compared to the same period in 2016. Currently, median rents across the five boroughs stand at $2,090 for a one-bedroom apartment and $2,490 for a two-bedroom apartment, according to the report. The city’s year-over-year rent growth lags the New York state average of 1.1 percent and the 2.7 percent national average. Elsewhere across the Empire State and nearby New Jersey, rent in Buffalo, Rochester and Hackensack saw year-over-year growth above state averages, with the latter experiencing a significant 5.2-percent spike compared to the same period in 2016. Hoboken, meanwhile, has emerged as one of the most expensive cities in the tri-state region, with two-bedroom apartments commanding a median rent of about $2,580. Eat your heart out, TriBeCa. Nationally, meanwhile, rental rates increased by 2.7 percent over the past year, with Sacramento (9.5 percent), Reno, Nevada, (8.8 percent) and Arlington, Texas, (7.9 percent) leading the pack. Despite the declines across the Big Apple, in fact, New York City remains one of the most expensive cities in which to live, with its median $2,500 two-bedroom apartments eclipsing the $1,200 price tag on a similarly sized apartment in Arlington, according to the monthly report.